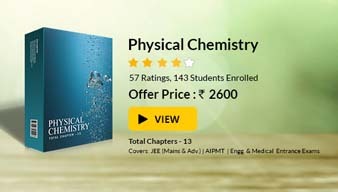 Physical Chemistry by P.W. Atkins mathematically explains all concepts! 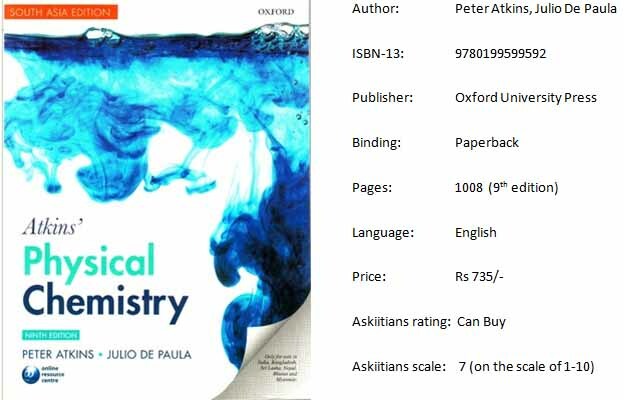 Atkins Physical Chemistry book can help you clear concepts used in solving Physical Chemistry numerical quite well. It includes enhanced explanations and mathematical presentation of the concepts; several solved examples, and self-test. There are exercises at the end of each chapter. There is a checklist of key equations too at the end of every chapter which is quite useful for students during revisions. Full color text design is helpful in engaging students and makes the book interesting to read. The broad coverage of the book, concise explanations and the mathematical explanations and presentations make this book quite popular among students preparing for JEE and other engineering entrance exams. Hence, Atkins Chemistry pdf is easily available online. The new Fundamentals chapter added in the ninth edition at the beginning of the book gives students a quick overview of the basics and key principles of Chemistry. The best covered topics in Atkins Chemistry book are Equilibrium, Structure of Molecule and Quantum theory. However, one would need to look into other Physical Chemistry books to master topics like Solid State and Surface Chemistry. The only point that goes against this book is also its highlight. It has too much explanation and students are likely to waste more time than required in checking out the presentation of its mathematical content. This may hamper their JEE preparation.